With their symbolic meanings and seemingly infinite design possibilities, cloud tattoos are becoming increasing popular. Whether on their own or as part of a larger designer or scene, clouds are able to connote a variety of meanings, while design-wise, there are several variations and styles you and your tattoo artist can work with to create the perfect cloud tattoo for you. Like any tattoo, the cloud may hold a more personal meaning to you, one that is not included on the list above. That's great! Tattoos are unique to each and every individual and should be worn with pride. Depending on the meaning you wish to impart, there are a variety of styles and designs you can choose for your cloud tattoo. Always make sure to work closely with your tattoo artist to ensure that your vision is clearly understood and realized. Sometimes just getting a simple cloud is the best, especially when you wish to tie the symbol to your particular culture or heritage. Many cultures attribute symbolic meaning to the cloud, so often there is no need for additional images in order to convey a deep and powerful meaning. For instance, in Chinese symbolism, the cloud represents transition and transformation, often indicating an individual's evolution from the primitive to the spiritual. If this meaning rings true for you, consider getting your cloud tattoo done in a distinctly Chinese style, such as through depicting the clouds in swirls along the upper arm and shoulder, or by including the Chinese symbols for 'transition' and/or 'transformation' under or inside of the cloud(s). Throughout our lives, we will face at least a few dark times and difficult situations. 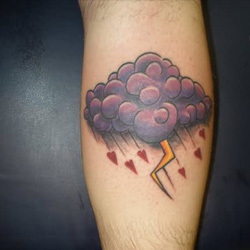 Making it through to the other side is an important achievement, and you may want to mark this accomplishment by getting a rain cloud tattoo. For many, a rain cloud is representative of darkness and of a troubling time, and getting this symbol can serve as a reminder that you faced a difficult situation and made it out alive, perhaps even stronger than you were before. There are a few variations on this design. The classic design involves a dark cloud, usually a shade of grey or black, with rain precipitating from it: depending on your style preferences, the rain can be colored (traditionally blue, but this is by no means a rule!) or in grey scale. Some choose to include a face in the clouds, which might be looking downcast or angry, and can be simple or incredibly realistic. You may also wish to include lightening bolts if the difficult time was particularly shocking: such an electrifying symbol can make clear that you made it through a perilous situation. If you would prefer to focus on the outcomes of this situation, such as personal growth or resilience, you may want to include an umbrella or a rainbow to further demonstrate that you made it through this tough time, and that the you've found the silver lining in your experience. To further personalize this tattoo, you can include an inspirational quote or the date of the experience as part of your design. Resulting from an atomic bomb, the mushroom cloud is a clear symbol of catastrophe and destruction. Most notably, the mushroom cloud is an iconic symbol of the atomic bombs dropped on Hiroshima and Nagasaki at the end of WWII. The duality of this event, solidifying victory for the Allied forces but at the expense of thousands of civilian deaths, thereby adds another layer of meaning to this symbol: while great advances in science and technology were made and a war won, there was also a very real human loss as a result. Designs for mushroom cloud tattoos can explicitly reference this scene from history, or they can be a bit more abstract. For an historical take, include a cityscape of Hiroshima or Nagasaki in the foreground of the design, or put one or both of their geographic coordinates underneath the cloud. If you are taking a more abstract approach, you can personalize this design by putting a name or date of significance at the base of the design, or by including additional imagery such as a gasmask, to signify a more destructive meaning, or an image of duality, such as the yin and yang symbol or an angel/devil figure, to further emphasize the dual nature of humanity and the world in general. 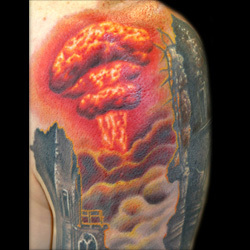 Whether you choose a literal or figurative interpretation of the mushroom cloud, this design can be beautifully done in either grey scale or full color, and placed almost anywhere on the body: whether you want a small mushroom cloud at the base of your wrist or a large scene that covers your entire back, this tattoo can be done to almost any personal specifications you may have! This simple yet meaningful design can depict several meanings, each unique and individual to the person wearing it. 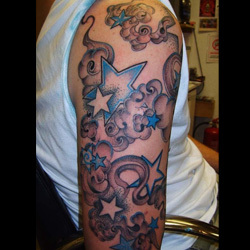 Clouds are often indicative of the heavens and the God or gods that reside there, and weaving in additional meaning through the use of stars, which can represent individuals who have passed away, one's zodiac sign, or a constellation of personal meaning, is a great way to depict a doubly symbolic tattoo. 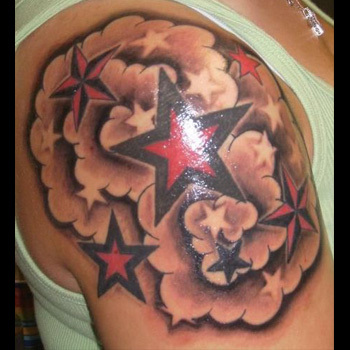 The two different elements of this tattoo, the stars and clouds, mean that you can twice as many opportunities to make this tattoo unique to you. One option, an excellent choice if you are representing lost loved ones, is to join the stars together to form either a constellation or another pattern that demonstrates their connectedness to you. You can also include birthdates or names in the stars to represent each individual. In terms of color, this design looks good in either greyscale or full color: you can have vibrant white clouds and gleaming yellow stars for a more realistic look, or choose the individuals' favorite colors for the stars for a more playful and personalized look. You can also include a quote in the design that has a special meaning to you or those who have passed away, such as a bible verse or an inspirational saying. Another design featuring stars and clouds is of a more patriotic bent. This is a particular favorite for Americans, Australians, and any other citizens of countries with stars in their flags. Proud Americans can choose to get red, white, and blue stars set against the lofty backdrop of clouds, while patriotic Australians might choose to get the Southern Cross constellation, depicted on their nation's flag, amongst the stars. As the cross is one of the predominant symbols of Christianity, this design is ideal for anyone who wants a unique way to express his or her religious faith and beliefs. Set against a backdrop of clouds, the cross clearly indicates Jesus' position in heaven and demonstrates your hope and wish that one day you will be there with him. While a simple cross may suit your needs, this design can easily be elaborated and made even more personal and unique. You may want to get your favorite bible verse written underneath the cross, or on a scroll going across it and the clouds. If the tattoo is in memory of a lost friend or loved one, you may wish to get their name or birthdate on the cross to demonstrate that they'll always be in your memory. This is especially meaningful if this person was lost during combat or in the line of duty, as the cross is also a symbol of sacrifice. For those wishing to make a more overt religious statement, you may wish to consider depicting Jesus' crucifixion on the cross. This design is a clear demonstration of your religious faith, and the immense importance that His sacrifice on the cross holds in your heart and mind. To personalize this design, you may want to add your favorite bible quote underneath the cross and clouds, adding a more unique meaning to the scene. 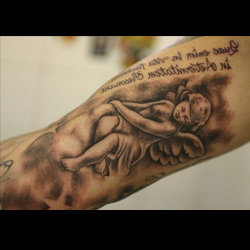 Another great design for your cloud tattoo is to include angels amongst or on the clouds. 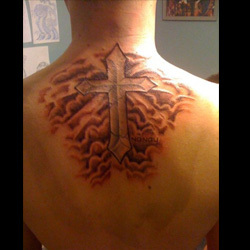 Depending on the personal meaning this tattoo holds for you, the design can be done in several different ways. You may wish to have your guardian angel represented in the clouds: this can be done by designing the angel as seen in art (such as in Raphael's Victory of St. Michael), or by including certain symbols that are associated with your guardian angel. This is a great tattoo to get if you want to express your faith in a unique way, or you wish to always have a reminder that someone is watching over you. You can also use angels in the clouds to represent friends or loved ones who have passed away and are now looking down on you from heaven. While you can use generic cherubs to represent these individuals, a more personal design choice would be to represent your loved ones in the faces of the angels. This way you'll have a constant reminder of those you love, secure in the knowledge that they're still with you and watching you from above. Angels are often seen as peaceful and good creatures, but they can also be depicted as fallen individuals, such as Lucifer. A unique spin on the traditional angel and clouds design is to have a fallen angel amongst dark and stormy clouds: this is a great way to demonstrate your own dark nature or your status as a fallen individual. In addition to dark clouds, you could also include flames to represent hell. The angel can be represented as Lucifer, or you can design it so that its face is hidden (sometimes we're haunted by that which we cannot see), or even so that the face is your own. Whichever design you choose, this tattoo can be personalized in several different was. Whether you're memorializing a loved one, demonstrating pride in your country, or depicting your individual traits of darkness or duality, a cloud tattoo can be a great choice when picking a unique and personal design. Easily customizable and with a wide variety of design choices, cloud tattoos are perfect for men and women, for your first tattoo or tenth, and can be adapted to fit almost any place on your body! 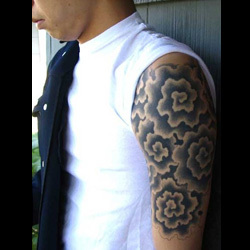 For custom design of a Cloud, you can check our Custom Tattoo Page.